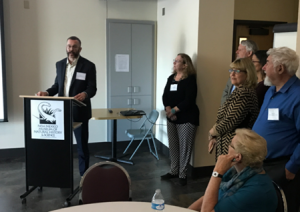 On October 17th, the Libraries Transform New Mexico steering committee conducted a follow-up meeting in Albuquerque at the New Mexico Museum of Natural History and Science. Forty-five participants attended the meeting, representing school, public, academic, and tribal libraries; stakeholders; and leaders. 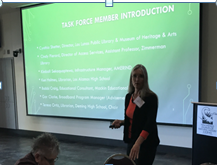 The purpose of the meeting was to present the findings of three task forces on the topics of E-Rate/Broadband, Alternative Income Sources, and Public Funding, and then create an action plan based on those findings. Siobhan Reardon, Executive Director of the Free Library of Philadelphia and her colleague Sandy Horrocks, presented on creative ways to fundraise, how libraries can benefit from adopting business thinking, and how this can expand libraries’ engagement with the community. Tuesday’s meeting was a follow up to LTNM’s ongoing research and planning effort that will ultimately drive significant changes for libraries, and therefore increase social & educational impact that libraries provide. The LTNM effort kicked off with a statewide assessment in 2015 and has been followed by ongoing research and dialog to identify needed resources and pathways to attain those resources. More on the background can be found below. Over the past year, the three task forces have been researching, surveying, and analyzing information in order to compile cohesive reports. The three reports detail libraries’ current level of service and engagement in relation to the priorities. With this information in hand, Libraries Transform NM organized a follow-up convening on October 17. The objective of this meeting was to springboard discussions from these reports, identifying strong pathways to success. 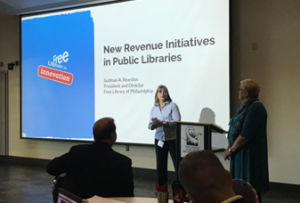 Siobhan Reardon, Executive Director of the Free Library of Philadelphia, presented on innovative ways libraries can bolster funding with enterprise. Ms. Reardon is very successful in fundraising and private-public partnerships to generate revenue. Business-thinking, meaning creating opportunities that increase the value of libraries and drive money making, may play a vital role in the future livelihood of libraries. Before a library can truly explore enterprising, a foundation or friends group must first be established. This is significant, so funds raised remain easily expendable by the library. Some takeaways from her presentation include models of success: partner with a local brewery to hold a beer garden night; brand cups, bags, t-shirts and sell them through the Friends; host cooking classes with a local chef and charge a nominal fee; or open a cafe (or cafe night) and split the proceeds with the vendor. Her inspiring talk certainly set the stage, highlighting that libraries are not simply government offices with public information: instead, modern libraries are dynamic community hubs, where the missions are expanded to host social, cultural, and knowledge-sharing events. Next, the three task forces presented their reports, which included a status review and broad recommendations. 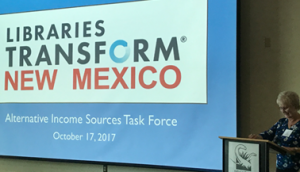 Summary sheets and detailed reports can be found here https://sites.google.com/site/librariestransformnm/ltnm-next-steps-conference. In the afternoon, the 45 attendees joined break-out groups. The task was to discuss report recommendations and identify the best pathways for libraries to follow to successfully attain resources. Create a unified Marketing/Advocacy campaign. Initiate policy review and legislation for libraries. Evaluate the potential of collaborations and shared services. Write and present a bill to establish a fund that DoIT would provide comprehensive support for E-Rate applications and matching funding. Support DoIT to publicize their online resources, which provides necessary information for libraries’ E-Rate applications and pricing negotiations. Create a comprehensive plan for fundraising education and implementation, including NMLA contracting with a fundraising consultant to provide project support. Create fundraising web resource page. Create a fundraising special interest group. The LTNM Steering Committee will identify common goals and create a map for the library community to succeed in reaching those goals. Following the October 17 event, the Steering Committee will gather feedback from webinar attendees, delegates, NM library community, and stakeholders. Synthesizing the Task Force reports, the October 17 discussions, and the survey feedback, the Steering Committee will recommend prioritized short, medium and long-range objectives that address primary, identified issues. The draft objectives will be shared with the library community for review. Then, subcommittees will be formed to implement the plan. The LTNM effort is representative of all NM libraries, all shapes and sizes, and the library community as a whole. Your perspective, input, and action are what will drive the success of your library and libraries across the state. Some simple ways to get involved are to follow the LTNM project, contribute your ideas through dialog and survey responses, and be prepared to support action plans. If you feel a calling to contribute more, either through an LTNM committee or subcommittee, please contact any one of the Steering Committee members. With a common goal, we will, together, drive increased success for NM Libraries. 2015-16: Assessing Libraries in New Mexico In 2015, the New Mexico Library Foundation spearheaded an effort assess the current state of all libraries in the state. The assessment collected data, conducted surveys and focus groups, to compile a current picture of how libraries are faring, where they succeed, and what resources libraries need. This report led to the next question: What resources do NM libraries need to do more? With those priorities identified, the Libraries Transform New Mexico Steering Committee set out to develop the basis for action plans. Three task forces were formed, each focusing on one of the three priorities. Those reports informed Tuesday’s dialog.